I am so excited to welcome Robyn from Simply Fresh Dinners. Something that you quickly learn about Robyn’s food is that it is always fresh and gorgeous. I first found Robyn at Whimsy Wednesdays when I featured one of her absolutely stunning pasta recipes. She continually blows me away with her photography and I am so thrilled to have the chance to work with her on this series. Be sure to stop by and enter to win the NINJA Supra Kitchen System that she is giving away! As well as check out Cupcakes & Kale Chips for some Healthy Desserts or Love Bakes Good Cakes for some Healthy Meal Ideas for our #EatHealthy15 Series. Hi everyone, I’m Robyn from Simply Fresh Dinners and I’m thrilled to share a healthy snack with Jenny’s readers today. I’m a big fan of The NY Melrose Family blog and an admirer of Jenny and the endless amount of energy she invests to bring unusual and captivating topics to her readers. She has created a dynamic community of enthusiastic foodies who love to bring you their favorite dishes. So let’s start cooking so we can get to my favourite part – eating! If we want to keep healthy eating exciting, we need to ensure there are loads of flavors in each dish and this one has it all. 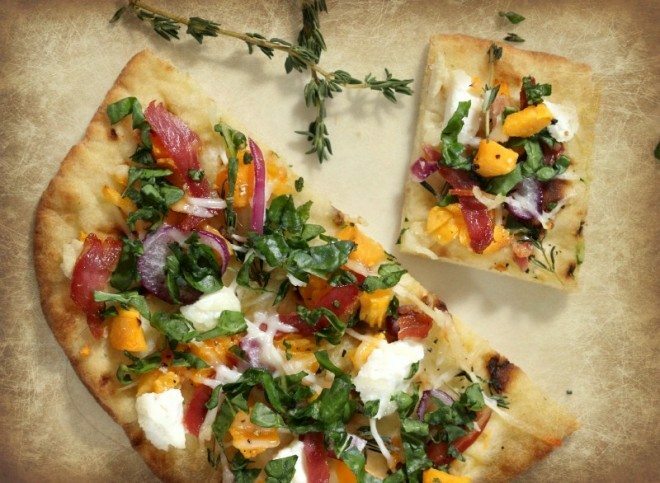 This flatbread pizza has maple -roasted butternut squash, red onion, chard, pancetta, fresh herbs, ricotta and pecorino cheese – how`s that for an explosion of the taste buds? The sweetness of the maple syrup complements the saltiness of the pancetta and when you add the creaminess of the ricotta you`ve got a glorious bite of gusto with texture, too! There are two things you must promise me you will do when you make this dish. Number One – use only pure maple syrup. Pancake syrups (with no real maple) are no comparison. True maple syrup has a complex, nuanced sweetness and it works equally well in savory and sweet dishes. It will keep, refrigerated, for several months. It’s all natural, high in calcium and has loads of vitamins and minerals. I use it instead of sugar to bring a more subtle sweetness in almost all of my recipes. At the bottom of this post, you’ll see a list of other uses for maple syrup. Promise Number Two – buy fresh pancetta, not the cubed stuff. Fresh pancetta should look pink and damp. Avoid anything that looks discolored and dry. The fat should be white and creamy colored and the rind should be thin and elastic. This recipe is a great way to get your kids involved in the kitchen. Pizza is always a popular choice and they can help in the assembly. Teaching kids healthy eating habits at a young age is imperative if they`re going to develop a vital, fit lifestyle. This dish has a few components but they`re quick and easy and you`ll be delighted with the results. It`s a great snack for a large group or can be dinner for a small family. More proof that eating healthy can be your every day eating. I know you`ll enjoy this as much as I do. Cheers! 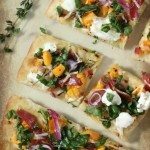 An easy yet healthy flatbread pizza with butternut squash and pancetta. In a large bowl, toss the squash with 2 Tablespoons of the maple syrup, 1 1/2 teaspoon of the oil, 1/4 teaspoon salt and 1/8 teaspoon pepper. Spread it in a single layer on a large heavy-duty rimmed baking sheet and roast until tender and lightly browned, about 12 minutes. Let cool to warm. Lower the oven temperature to 425 F.
Using small pan, cook pancetta over medium-high heat for 2-3 minutes on either side. Remove from heat, place on paper towel while you prepare other ingredients. Brush the Naan pizza crust lightly with 1/2 tablespoon extra virgin olive oil, ensuring you cover the entire crust. 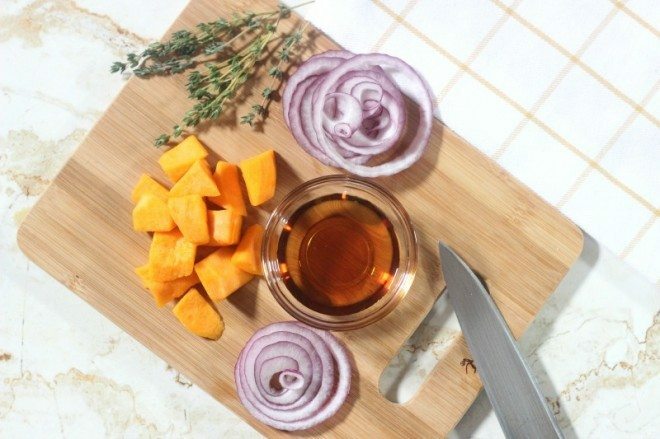 In a large bowl, gently toss the squash, onion, thyme, 1 1/2 teaspoon of the remaining oil, 1/2 teaspoon salt and 1/4 teaspoon pepper. Scatter the squash mixture evenly over the pizza, top with sliced pancetta, and teaspoons of ricotta all over. Sprinkle with the pecorino and baked until brown. About 12- 15 minutes. In a large bowl, whisk the remaining 1 Tablespoon syrup and 1 Tablespoon oil, the vinegar, 1/2 teaspoon salt, and 1/4 teaspoon pepper. Add the chard to the bowl, toss and coat. Scatter the chard over the flatbread. Cut into pieces and serve. You`ll want to pop over to the blog today to enter a chance to win a NINJA KITCHEN SYSTEM. Isn’t that fabulous?! Click HERE for a chance to win. Here are some of my other favorite snacks from Simply Fresh Dinners. You don’t have to give up taste to eat well! Robyn lives in Canada and has an affinity for all things ocean, including seafood. She loves finding new ways to create dishes with fresh ingredients, low in calories and most of all, DELICIOUS! She believes healthy dishes do not have to be time consuming and expensive and she wants to convince you of that, too! Hello Jenny and Robyn! I love this pizza with all of the fresh ingredients. My boys were just asking if we could have pizza for dinner tomorrow so can’t wait to give your recipe a try. 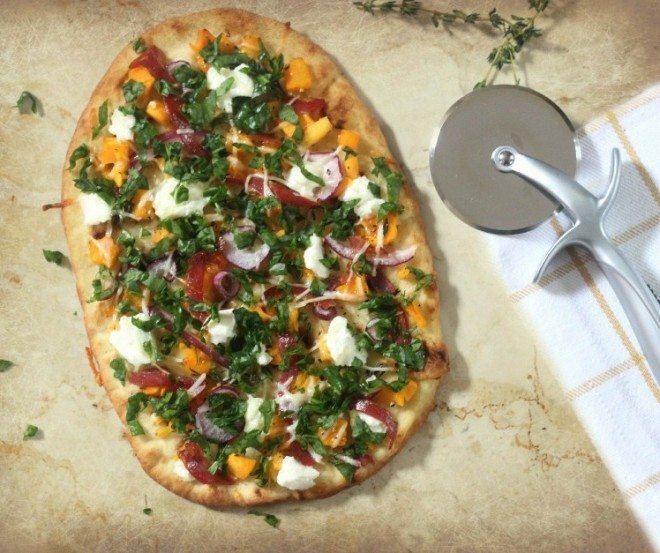 You know the first time I had roasted squash on my pizza was on my first trip to Cambridge, UK for a wedding. I was in love instantly with the delicious squash and they also topped the pizza with fresh rocket too. This is a great little recipe. Wishing you both a super weekend! I’m so late in replying to this comment! Thanks so much for your kind words. I really loved the roasted squash combined with greens. It opens up whole new thought on pizza toppings doesn’t it? Have a great weekend! Love all the fresh ingredients. Looks so tasty! Thanks so much, Amy – it really was delicious! 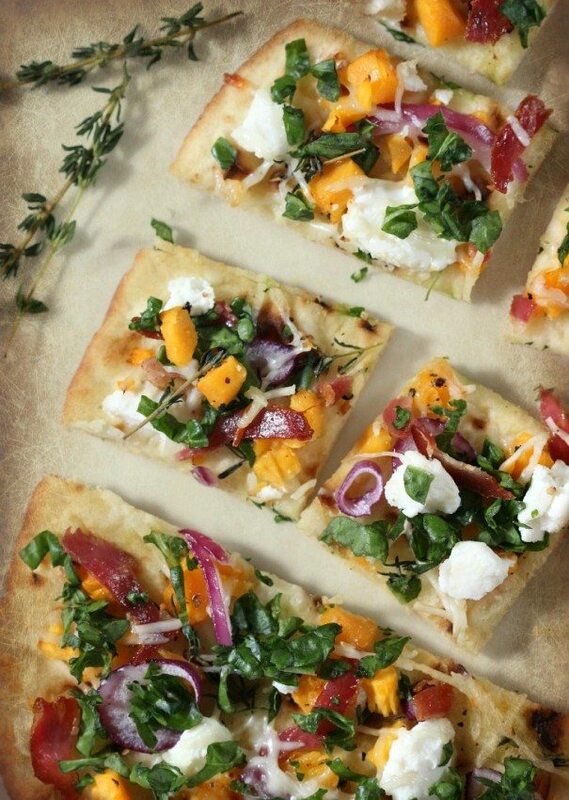 This pizza looks like an amazingly healthy way to satisfy my pizza cravings! I love all the veggies you put on top and the pancetta. Pancetta! I love that stuff and could seriously put it on everything. I featured your recipe in my latest post, “Kick Start The New Year #3: 15 Healthy Lunches”! This looks delicious. I was looking for a new healthy pizza recipe and this looks perfect. I wish I had it in front of me right now, it’s making me hungry! Thanks for sharing.